Hucker, Jacqueline. "Monuments of the First and Second World Wars". The Canadian Encyclopedia, 05 November 2018, Historica Canada. https://www.thecanadianencyclopedia.ca/en/article/monuments-of-the-first-and-second-world-wars. Accessed 21 April 2019. 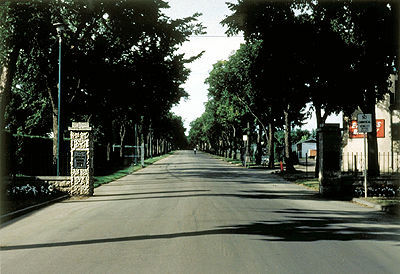 Memorial Avenue, Saskatoon (courtesy Department of Canadian Heritage). The Passing of the Torch, Vimy Monument, France (photo by Jacqueline Hucker). Ross Bay Cemetery, Vancouver Island - the Naval Memorial bearing the names of 39 officers and men who were lost at sea. Of these, 36 were from the HMCS Galiano, which sunk on 30 October, 1918 (photo by Jacqueline Hucker). Newfoundland Monument at Beaumont Hamel, France (photo by Jacqueline Hucker). Halifax Memorial (photo by Jacqueline Hucker). National War Memorial, Ottawa - Confederation Square (courtesy Parks Canada/photo by B. Morin). Since the end of the First World War, monuments commemorating the lives of Canadians who died in conflicts overseas have occupied a prominent place in our urban cultural landscape. Most were erected in the 1920s and 1930s and represent a commitment never to forget Canadian lives sacrificed in the First World War. The Second World War's claims on Canadian lives reinforced this commitment. In an era when few monuments to contemporary national heroes or great historical events are erected, war monuments retain their capacity to erase time and preserve a memory of those who died for their country. The official war memorial, which attempts to honour all those who died, is a phenomenon of the First World War. Although monuments to individuals could be found earlier, there were few British or Canadian antecedents for national memorials. The unprecedented violence of the First World War demanded a new form of commemoration and, with rare exceptions, this took the form of memorials which, rather than glorify war, attempted to express in a permanent and dignified manner the unimaginable scale of the human sacrifice that occurred between 1914 and 1918. In May 1920 a special committee of the House of Commons recommended that permanent memorials be erected in France and Belgium to commemorate the exploits of Canadian troops in the First World War. Subsequently, the Canadian War Memorials Commission (CWMC) was established to oversee the erection of 8 monuments on selected battle sites: the St-Julien Memorial, the Hill 62 (Sanctuary Wood) Memorial and the Passchendaele Memorial in Belgium; and the Courcelette Memorial, the Vimy Memorial, the Le Quesnel Memorial, the Dury Memorial and the Burlon Wood Memorial in France. 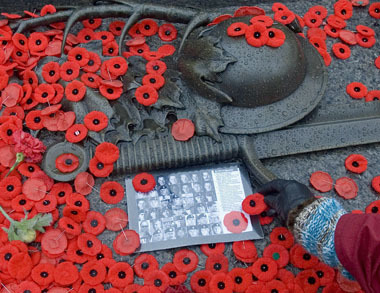 Canada, a country of about 8 million people in 1920, lost 60 661 young servicemen in the First World War. The task of burying the dead and securing for them an honourable grave fell to the Imperial War Graves Commission (changed to the Commonwealth War Graves Commission in June 1964), whose member countries were Great Britain, Canada, Australia, New Zealand, India, South Africa and the British colony of Newfoundland. Through the combined work of the IWGC and the CWMC Canada became officially involved for the first time in the burial and commemoration of its servicemen and women overseas and at home. The IWGC formulated 5 general principles, which were approved by the Imperial Conference of 1918: there should be no repatriation of bodies (soldiers should be buried together where they fell); no distinction should be made between the graves of officers and men lying in the same cemetery; no private memorials should be erected on the battlefields; each soldier should be individually honoured; and the memorials should be permanent. These expressed a shared belief that each soldier should be commemorated for his role in an event of collective heroism, an idea that had developed steadily since the Crimean and the American Civil wars. 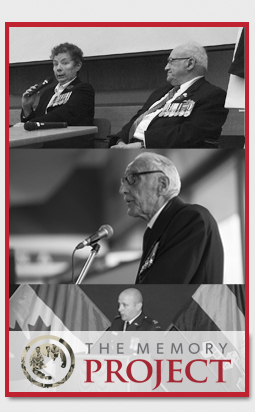 These principles of commemoration have informed Canada's First and Second World War memorials and continue to govern the burial of Commonwealth servicemen and women around the world. The IWGC, which was made responsible for all the military cemeteries for Commonwealth countries, employed accomplished British architects and landscape designers to give visual form to the task of honouring the dead. 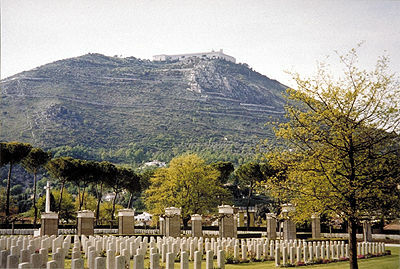 Military cemeteries quickly became identifiable through their precise rows of identical white headstones usually set in a carefully manicured landscape and separated from the surrounding countryside by low walls. All but the smallest have a Cross of Sacrifice, a monument designed for the military cemeteries by Sir Reginald Blomfield. Larger cemeteries also have a Stone of Remembrance, designed by Sir Edwin Lutyens, the IWGC's most creative architect. Faced with a lack of precedents for collective memorials, the CWMC chose a juried competition as a means of selecting designs for the Canadian monuments to be erected overseas. The guidelines stipulated that monuments be highly visible, permanent in nature, incorporate figures and be designed for a landscaped setting. 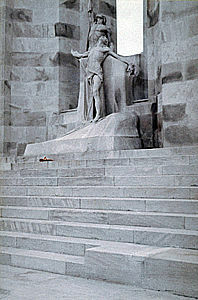 An entry submitted by Toronto sculptor Walter S. Allward was selected as the pre-eminent overseas monument commemorating Canada's role in the First World War. It was to be placed at the highest point of Vimy Ridge, to honour the memorable victory of the Canadian Corps, fighting as a unit for the first time, in seizing the ridge in April 1917. Work on the structure began in 1925 and the monument was unveiled in July 1936. The Vimy Memorial is a soaring structure overlooking the Douai Plain. Its dedication reads "To the Valour of Their Countrymen in the Great War and in Memory of Their Sixty Thousand Dead, this Monument is Raised by the People of Canada." The monument is executed in a modern classical style favoured by the IWGC and its artistic inspiration is rooted in tradition. It is adorned with 20 heroic figures that symbolize the sentiments of tragic loss suffered by individuals and the country at large. Collectively the figures condemn the evils of war and speak to higher virtues aspired to by Canada. The most important figure, representing the "Spirit of Canada mourning her fallen sons," looks down upon a stone sarcophagus crowned with laurel. Conveying the psychological needs of a people, the monument fuses classical iconography and composition with contemporary European expressionist influence to create an original work of modern design. This isolated figure is made more poignant by the proximity of Canadian Cemetery No. 2 containing the headstones of 2904 Commonwealth soldiers, of whom 695 are Canadian. The felt need to honour the memory of half a million British Empire servicemen who had no grave was of great concern to the IWGC which, after much deliberation, concluded that the most appropriate way would be to incorporate the name of each individual into large memorials. As a result, the names of the 11 287 Canadians who died in France with no grave are carefully recorded on the Vimy monument's walls. The list is organized alphabetically and no distinction is made between officers and men. As with the precise lines of headstones in the cemeteries, the sheer number of names serves to underline the extent of the slaughter. The names of the 6940 Canadians missing on the Ypres Salient in Belgium are inscribed in the walls of the Menin Gate, the British Empire's principal monument to those military dead who have no marked grave. The names of 64 Canadian seamen who were lost on vessels mined or torpedoed are inscribed on the Hollybrook Memorial near Southampton, England. The names of 46 Canadian airmen are recorded on the Airmen's Monument in the Faubourg d'Amiens Cemetery in France. The IWGC supervised the erection of the 2 latter monuments. Closely associated with the enumeration of names was the veneration of the unknown warrior. Representing the great number of men and women who gave their lives while serving in the forces of the British Commonwealth, the unknown warrior was the only body of a British soldier repatriated after the First World War. It is buried in a hallowed grave in Westminster Abbey. An entry submitted by Frederick Chapman Clemesha, a sculptor from Regina and a former member of the Canadian Corps, was selected by the CWMC to mark each of the remaining 7 Canadian battle sites in France and Belgium. His design, a bowed head of a brooding soldier on a shaft 11 m high, shares the same melancholic introspection of the figures on the Vimy Memorial. 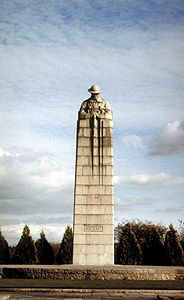 When erected at St-Julien, beside the main road from Ypres to Bruges, the monument's powerful impact led the jury to reconsider the decision to duplicate it at the 6 other sites. They did not want to diminish its effect by replicating it. As a result, these sites are marked by a simple stone of Stanstead granite set in a landscaped garden. After their completion in the mid-1920s, the sites became links in a chain of memorials that included more than 900 Commonwealth cemeteries, making the length of the battle front a via dolorosa, or a road of remembrance. 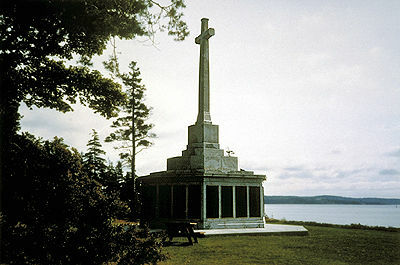 Newfoundland, not a part of Canada during the First World War, received its own war monuments. The exploits of the Royal Newfoundland Regiment earned the small British colony 5 overseas memorials: the Beaumont Hamel Memorial, the Gueudecourt Memorial, the Monchy-le-Preux Memorial and the Masnières Memorial in France; and the Courtrai Memorial in Belgium. 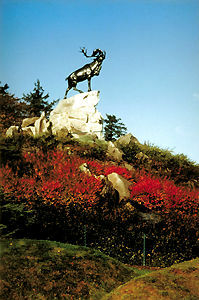 Each of these structures consists of a cairn of Newfoundland granite in the form of a natural outcrop of land supporting a majestic bronze caribou, the emblem of the Royal Newfoundland Regiment, its antlered head straining against the sky. The mounds are surrounded by native Newfoundland plants. At Beaumont Hamel on 1 July 1916, the opening day of the Battle of the Somme, the Newfoundland Regiment was destroyed by enemy fire as it advanced across the exposed slopes. On the cairn, 3 tablets of bronze carry the names of 814 members of the Royal Newfoundland Regiment, the Newfoundland Royal Naval Reserve, and the Mercantile Marine who lost their lives in the First World War and who have no known grave. Newfoundland sent 8500 soldiers and sailors overseas out of a population of less than 250 000. Of these, 1500 lost their lives. Their names are remembered on the Newfoundland National Memorial in St John's, where a ceremony is held each year on July 1st, the anniversary of the battle at Beaumont Hamel. In Canada, the government erected 4 national monuments: 2 in Ottawa, the others in Halifax and Victoria. 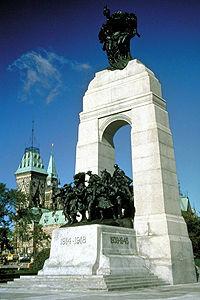 In Ottawa a competition was held in 1925 for a National War Memorial to be erected in the capital. The winning entry, submitted by British sculptor Vernon March and entitled The Great Response of Canada, depicts uniformed figures of men and women representing all the services purposefully passing through a granite arch of victory. Its combination of realistic figurative art and simplified architectural form reflects the transition in monument art that was occurring with the rise of the modern movement. The memorial was unveiled in the spring of 1939. Each year on Armistice Day a service is held there to pay respect to the memory of those who died fighting for their country. The Memorial Chamber in the Peace Tower of the Parliament Building is the second Ottawa Monument. Designed by architect John Pearson, the Memorial Chamber recalls an elaborately jewelled medieval chapel and, like these earlier structures, derives its commemorative power from the collective effort of artists and craftsman whose works adorn the space. Initial plans called for the names of the 66 655 Canadians who died from the causes of war between 4 August 1914 and 30 April 1922 (the date of the final demobilization of the Canadian Expeditionary Force) to be carved into the chamber's stone walls. When the space proved inadequate, it was decided to create a Book of Remembrance in which each name would be inscribed. Echoing the battlefield memorials, the Book of Remembrance rests on a stone altar, while the figure of Canada depicted in the stained glass windows looks down upon the altar. The third Ottawa Monument, the Nursing Sisters' Memorial, is also found in the Parliament Building. A marble panel on the wall of the Hall of Honour, it illustrates the history of the nurses from the earliest days in Canada to the First World War. The panel was designed by G.W. Hill of Montréal. The 415 Canadians from naval and merchant ships who died in the Atlantic Ocean during the First World War are commemorated in Pt. Pleasant Park in Halifax. The original monument, which became badly weathered, has been replaced by 2 later monuments. The present structure, erected in 1969, consists of a large Cross of Sacrifice inscribed with the names of 3257 Canadian men and women who were buried at sea as a result of the World Wars. The Victoria Monument at Ross Bay Cemetery on Vancouver Island commemorates those who were lost or buried at sea in the Pacific Ocean. It stands in the section set aside as a military cemetery and laid out in accordance with the design guidelines established by the IWGC. This is one of many such cemeteries across the country, where servicemen and women who died in Canada from injuries suffered in the First and Second World Wars are interred. Brookside Cemetery in Winnipeg, which holds more than 6500 servicemen and women, includes 470 war graves. It is the only cemetery in Canada to have a Stone of Remembrance, which was unveiled in 1960 by the CWGC to honour the sailors, soldiers and airmen of the Commonwealth who served in both wars and who are buried in Canada. The decision not to repatriate the bodies of the servicemen and women who had died overseas had a significant impact in Canada, where almost no community or institution remained untouched by the death toll of the First World War. The early 1920s saw monuments erected in cities and towns from coast to coast. Business corporations, educational and religious institutions, and worker's groups also felt the need to commemorate lost colleagues through a monument or a plaque. 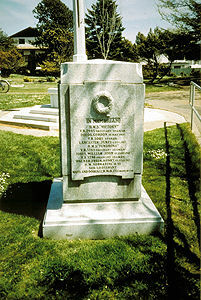 A cenotaph, inspired by Lutyen's memorial in Whitehall, London, was the choice of a number of Canadian cities, including Montréal, Toronto, Hamilton, Victoria and Vancouver. Smaller centres frequently favoured inscribed granite markers, memorial fountains, arches, a version of Blomfield's Cross of Sacrifice or monuments embellished with figures executed in stone or bronze. Many of Canada's most talented sculptors received commissions for monuments. Their designs reinforced the belief that each individual should be honoured. Emanuel Hahn, a former assistant in Allward's studio and chief designer for the Thompson Monument Company, designed many monuments, including 2 variations on the theme of a realistic soldier figure "going over the top." One was commissioned by Saint-Lambert, Québec; the second, the meditating figure of Tommy in his Greatcoat, was erected in Lindsay, Ontario. The dying hero was the subject of a number of memorials, but none more dramatic than the version created by the Montréal sculptor, Coeur de Lion MacCarthy, for the Canadian Pacific Railway. Depicting the angel of victory raising up a young soldier to heaven at the moment of his death, it was erected in Montréal, Winnipeg and Vancouver to the memory of the 1115 employees of the company who were killed in the war. Unconventional monuments include the replica of Clemesha's St-Julien monument, incorporated into the cenotaph designed by R.W.G. Heughan which was erected in Victoria Park, Regina, in 1926, and Allward's monument, Valour Defeating Barbarism, in Peterborough. Like the Nursing Sisters' Memorial, Florence Wyle's memorial relief to the English nurse Edith Cavell erected on the grounds of Toronto General Hospital represents an early precedent for commemorating women's wartime contributions. Another type of monument that made its appearance after the First World War was the memorial tower, of which Ottawa's Peace Tower is the most distinguished example. Others include the gothic Soldiers Tower attached to Hart House at the University of Toronto (Sproatt and Rolph), the Norfolk County Memorial Tower in Simcoe and the Seaman's Memorial Tower in Montréal. The Soldiers Tower at Hart House is adjoined by a vaulted space resembling a medieval cloister walk. On this wall are carved the names of the former university students and staff who died in the war. As with Ottawa's Memorial Chamber, the quality of the tribute lies in large part in the beauty of the craftsmanship and the calligraphy. Both the Simcoe tower and the Peace Tower incorporate a carillon, a feature that recalls the bell towers whose sounds would have been heard across the fields of France and Flanders. Landscape plays a large role in the design of the war memorials. Perhaps prompted by a belief that a conventional monument could not adequately capture the acute sense of catastrophe occasioned by the First World War, the Vimy Ridge site has preserved battlefield trenches, a tunnel and mine craters, rebuilding some with concrete to ensure their permanence. The Newfoundland overseas memorials are designed to recall a piece of that island's landscape, while at Beaumont Hamel, the largest of the battlefield parks established in memory of Newfoundlanders, extensive trenches, shell holes and craters are preserved. Together with Vimy Ridge, Beaumont Hamel remains one of the very few sites in France or Belgium where the visitor can see a Great War battlefield much as it was. The idea of preserving a battlefield has influenced the design of the Memorial Chamber in Ottawa, where the walls are lined with stone and marble from France and Belgium, and the floor paved with flagstones fashioned from the battlefields on which Canadians fought and died. Thus, not only is the battlefield preserved but the ground on which young Canadians shed their blood is symbolically brought back to Canada. Similarly, the City of Oshawa's Garden of the Unforgotten contains stones from different battlefields and a stone from Westminster Abbey, site of the tomb of the unknown soldier - a concept originating with the First World War. The pastoral appearance of the military cemeteries and overseas memorial sites stands in deliberate contrast to the battle-scarred landscapes of the Ypres Salient and the Somme. In Canada, the symbolic regeneration of the ravaged land also finds expression in tree-lined Roads of Remembrances such as Saskatoon's Next of Kin Memorial Avenue, as well as in the many parks created as settings for the war memorials. The Welland Growland War Memorial was planned as part of a regional beautification plan for the lands along the Welland Canal. Designed by Elizabeth Wyn Wood, the memorial, featuring 2 heroic figures, Man the Defender and Woman the Giver, set against the Canadian landscape, was intended to be visible and intelligible to passengers on passing boats. Ironically, the Welland Growland War Memorial was unveiled on 2 September 1939, one day before the outbreak of the Second World War. In 1945, the Commonwealth countries acted in concert when they decided to erect joint memorials overseas to honour the missing. Whenever possible, these memorials were placed within military cemeteries near the theatres of operations. Although their designs remained rooted in the classical tradition established by the IWGC, new materials and modern designs were occasionally introduced. Canadian servicemen and women are honoured on 6 memorials erected by the CWGC in Europe: the Cassino Memorial in Italy (194 names); the Bayeux Memorial in Normandy, France (270 names); the Groesbeek Memorial in the Netherlands (103 names); the Runnymede Memorial near London, England; the Brookwood Memorial in the Brookwood Cemetery, London (199 names); and the Malta Memorial (285 men of the Royal Canadian Air Force). Beyond Europe, the names of 213 airmen appear on the El Alamein Memorial in Egypt; 228 Canadians who died in the defence of Hong Kong are named on the Sai Wan Bay Memorial; and 191 Canadian airmen are inscribed on the Singapore Memorial. In Ottawa, the CWGC erected a monument to 809 men and women of the Commonwealth air forces who died during the Second World War in Canada, the United States and neighbouring lands and seas and who have no known grave. 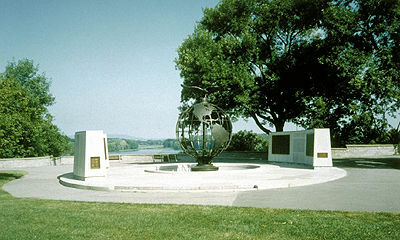 In the form of a bronze globe surmounted by a spread-winged bird of prey, the Commonwealth Air Force monument illustrates a more contemporary image for the CWGC. Also in Ottawa is the Cremation Memorial, a sheltered space that honours the memory of Canadian servicemen who died in Canada and the United States and who were cremated. As no changes were made to the rules governing military cemeteries, the CWGC began to repair damaged cemeteries and create new ones using headstones and cemetery monuments of the same design. As in the past, the cemeteries are beautifully landscaped and maintained. The Canadian Parliament decided to honour those who served and those who died in the Second World War through the construction of the East and West Memorial Buildings (originally called the Veterans Memorial Buildings) near the Parliament Buildings in Ottawa. Built between 1949 and 1956, the buildings are joined by a memorial arch inscribed with the words "All These Were Honoured in Their Generations and Were the Glory of Their Times." In 1957, an additional Book of Remembrance commemorating 44 893 servicemen and women who died in the Second World War was placed in the Memorial Chapel. Across the country the names of the newly dead were included on existing monuments. Occasionally new monuments were erected, but communities frequently chose to erect buildings for public use as a means of honouring the memory of their fellow citizens. War monuments retain their power and symbolism. This is particularly true for the cemeteries, where the approach taken by the IWGC to honouring the dead remains unchallenged to this day, but it is also the case with the Monument to the Missing and the Book of Remembrance. All 3 forms of commemoration were adopted for the 516 Canadians who died while serving with the United Nations forces in Korea. Their names are commemorated in a Book of Remembrance that was placed in the Memorial Chamber in 1962. They are also memorialized in the United Nations Memorial Cemetery in Pasan, Korea, where 378 Canadians lie buried and where the names of 16 are inscribed on the plaques commemorating those who were never found. In 1982, the National War Memorial was rededicated to all Canadians who have served Canada in time of war and the dates 1939-1945 and 1950-53 were added to the monument. Most recently, Books of Remembrance to the 2363 Newfoundlanders who lost their lives in war between 1914 and 1949 and to the dead of the Merchant Navy were dedicated in 1994. Despite contemporary challenges to earlier interpretaions of valour in war, those who gave their lives for their country remain heroes and the principles established after the First World War and embodied in the monuments ensure the national commitment to remembrance. Philip Longworth, The Unending Vigil: A History of the Commonwealth War Graves Commission, 1917-1967 (1967); Robert Shipley, To Mark Our Place (1987); Herbert Fairlie Wood and John Swettenham, Silent Witnesses (1974). Le chemin de la bravoureVoir une courte vidéo de trois soldats canadiens de Winnipeg, qui a gagné la Croix de Victoria de la Première Guerre mondiale. Une Minute du patrimoine de Historica Canada. Voir aussi liées les ressources d'apprentissage. The Greatest Victory: Canadas One Hundred Days, 1918See a synopsis of historian J. L. Granatstein’s book about the Canadian military’s success and sacrifice at the Battle of Vimy Ridge in April 1917. From indigo.ca. Valour RoadView a brief video about three Canadian soldiers from Winnipeg who earned the Victoria Cross in the First World War. A Heritage Minute from Historica Canada. See also related lesson plans.